Sometimes I really need some vegetable soup. It's the most comforting food I can imagine. Especially if it is a cream soup. The brilliant thing about it is that it doesn't have to be complicated. To me the best vegetable cream soups are plane, with one or two components and with no thickeners (like flour or heavy cream). One of my strong favorites is pumpkin cream soup I recently made. Another one is broccoli cream (I seem to like broccoli almost no matter how it is cooked). This time I made it with gorgonzola cheese. With its delicate flavor (relatively to most of other kinds of blue cheese) the combination played fine. 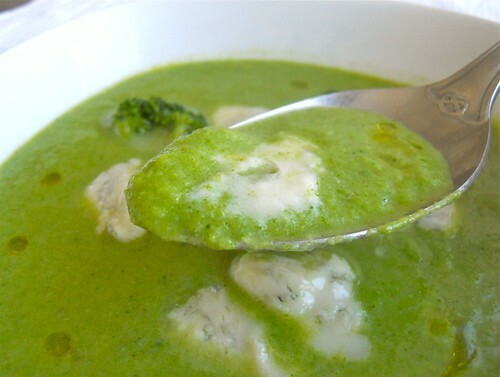 The savory tender gorgonzola pieces melting in natural sweet broccoli cream. To get the thing you do almost nothing. Peel and bruise the garlic clove. Heat some 2 tbs of olive oil in a medium pan. Add the garlic and fry for 1-2 minutes, till the aroma gets into the oil. Discard the garlic. Add the broccoli and cook stirring for 1-2 minutes. Add half a glass of water, cover and cook for another 3-4 minutes. Purée the broccoli with the liquid using a blender and transfer the cream back to the pan. Heat gently, season with salt and pepper to taste. Add some water if needed to reach the right thin soup texture. Pour the cream into the serving plate. Using a tea spoon cut small pieces of gorgonzola and add to the soup. Add a few drops of olive oil and enjoy. Thank you! That's great to hear :-). Hope you will enjoy. This looks really good, I love vegetable soups. Thanks! Me too. Great simple food. I should make some minestrone soon. Thanks, Maria, for dropping by and following me!! I love your fresh ingredients and healthy food recipe! This sounds delicious, I am haeving a soup for a year project and will definitely try this, thank you for the tutorial! Thank you charlotte! Great to hear this. What kind of project are you doing? Is that specifically broccoli you are looking for?